Hey and welcome to my website! This is a site that aims to help you find the best table saw for your needs. I come from a handyman background and over the years I have had a lot of experiences, both good and bad, with table saws. Without further ado here are the top rated products that I think are the best investment today. At any time you can click the link in the article to read the full review. The Dewalt brand is known worldwide for producing quality power tools and the Dewalt DWE7491RS is consistent with this. It gives you the best of both worlds for both power and portability. It has a strong 15 amp motor and heavy duty parts. Just because it’s tough doesn’t mean its a pain to move. It has a built in wheel stand that makes it easy to wheel this 110 pound saw around. If you need to make fast adjustments on the fly then you’ll like the pinion fence that can be adjusted with one hand. Safety is another thing that this saw excels in. It has an auto reset feature if the power cuts. Say there’s a power outage in the middle of a cut, the unit will automatically shut off until the green “on” button is pushed again. This makes it a good choice if there are kids in the area. 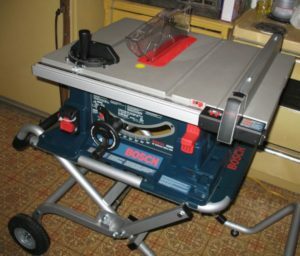 The Bosch 4100-09 is cited around the internet as being one of the best 10 table saws. I can’t really argue with this, the product is very solid. You wont have any boards sticking to the top of this one as the aluminum provides a good surface for the wood to slide over. The square lock rip fence is easy to adjust and provides great cutting accuracy with it’s sturdiness. A powerful 3650 rpm motor is what drives the 10 inch blade that will cut through a lot of different types of lumber. A riving knife provides a good solution to preventing kickback by digging into the wood and stopping it. Portability is also great with this unit as it has wheels and built in handles to push it around. A gravity rise stand makes setup and take down easy with just a lever. If you’re looking for a heavy duty cabinet table saw then this might be the product for you. It’s big and works well for those large scale projects where a portable model wont cut it. The level of safety is something that really makes the SawStop PCS 31230 stand out. It has an electronic system that can detect if the blade comes into contact with human skin and stop it in milliseconds possibly saving major accidents from happening. There’s also a lockout key to stop the unit from being operated accidentally. It’s a very big, accurate and powerful saw weighing 493 pounds and running a 3 hp motor. The 16 inch rip capacity of the Dewalt DW745, that comes in a portable 45 pound package is just one reason that this unit deserves a spot in your arsenal. The 3850 rpm motor gives it enough power to make it a very popular table saw for contractors and handymen everywhere. Just because it’s light doesn’t mean the build is cheap. It has solid metal construction which is better than the plastic that is usually found on saws in this category. Attached storage is another bonus for keeping accessories in one place. If you’re looking for a budget option without the bells and whistles that still performs, then the Skil 3410-02 is an option you will want to look into. A 5000 rpm, 15 amp motor drives the 10 inch blade, giving it enough power to get the job done for a lot of contractors. For a budget model the cutting accuracy is pretty good with the self aligning fence that has clear markings. There’s also a blade guard and riving knife that help to prevent kickback. These features make it a good option for beginners. Never worry about losing the necessary accessories with the on board storage capabilities. This table saw may not have wheels but it’s only 67 pounds so it can still be moved around when necessary. I say the affordability of this product makes it worth looking into. 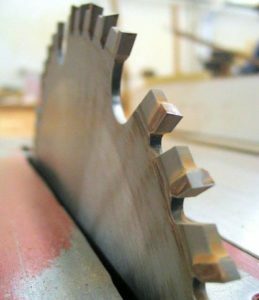 What are the Different Types of Table Saws? The first thing to go over is what the different types are, so that you can pick the one that’s most suited for your needs. Just like the name suggests stationary saws are designed to more or less stay in one place. They can be transported obviously, but not as easily as their portable counterparts. They are usually very powerful and accurate compared to the portable ones. A belt drive motor powers these bad boys and the table tops are cast iron or aluminum and heavy duty. There are 3 different sub types in the stationary category that I will expand on. These are bigger and commonly used by contractors like the name suggests. They typically weigh around 200-300 pounds and have powerful motors. Nowadays with the quality of the portable style being quite high these generally are not as popular. These types completely destroy other types of saws in pretty much every category except portability obviously. They are the definition of heavy duty and are made to last years. These are the type of power tool that you can pass down to your son and they will still be working 20 years later. If you are looking for a unit that is just going to stay in one place then one of these will be your best bet. They can slice pretty much anything, including pressure treated lumber and huge plywood sheets. These can be kind of difficult to categorize but they are kind of a blend of the older contractor and cabinet style. If they have inboard belt drive induction motors then they will generally fall into this category but other than that there aren’t many major differences to the cabinet style. Portable types are much more common nowadays than the stationary ones. Being able to move it around the job site easily is a major bonus. With the portability and smaller size there is a sacrifice of accuracy and stability, but they are still good enough to satisfy most peoples needs. They generally have 120 v motors under 2 hp. There are three main types in the portable category that I will go over below. These are the heavy duty type in the portable category. As you can guess they are great for the job site and deliver power in a portable and affordable package. The fact that so many contractors use these has given them the nickname of “contractor saws”, even though the real contractor ones are very different as I explained above. Just consider “job site” and “contractor” saws to be basically the same thing. These are the smaller types that are designed to be highly portable and light weight. Just because they are small doesn’t mean they cant pack a punch, but don’t expect them to compete with a monster cabinet style. Given that they are lightweight they can generally be carried around with relative ease. They do have a smaller rip capacity which makes them good for cutting softer woods and non full size materials. These are similar to bench top models but have some better features like stands. They have direct drive universal motors just like the bench top ones but look similar to full size models at a smaller scale. Blades: The most common blade sizes that you will encounter will have a diameter of 8, 10, and 12 inches. There are other sizes available of course if you take on special projects. As a side not make sure to look at the mounting hole size as that is a secondary blade measurement that cannot be ignored. As for what blade size to choose make sure to look at the table saw manual for instructions. Motor: It’s no secret that motor power is an important factor. If the motor is too weak then the cuts wont be as accurate which is obviously not good. A 1-2 hp motor can typically handle wood up to 2″ thick and if you are cutting bigger pieces then a 3+ hp motor may be necessary. Fence/Gauge: If you want to make accurate rip cuts then a good fence is absolutely necessary. Make sure you get a product with a good fence to maintain those sharp cuts. Gauges are another thing that are often overlooked. A few things to look into would be the miter angle, blade angle and height.